Together with B.C. 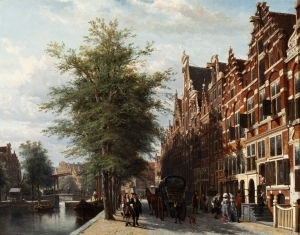 Koekkoek and A. Schelfhout, Cornelis Springer belongs to the leading painters of Dutch Romanticism. He became a member of the Amsterdam painters collective Felix Meritis and won a gold medal for a painting of a church interior in 1847. He was awarded the Leopold order of Belgium in 1865, and in 1878 he was invited with Jozef Israëls to advise the Dutch Ministry of Public Affairs on the plans for the Rijksmuseum. Springer often assigns a prominent place to 17th and 18th century buildings in his paintings. Sometimes this is in the form of an imaginative piece of architecture, but in most cases these were existing buildings.